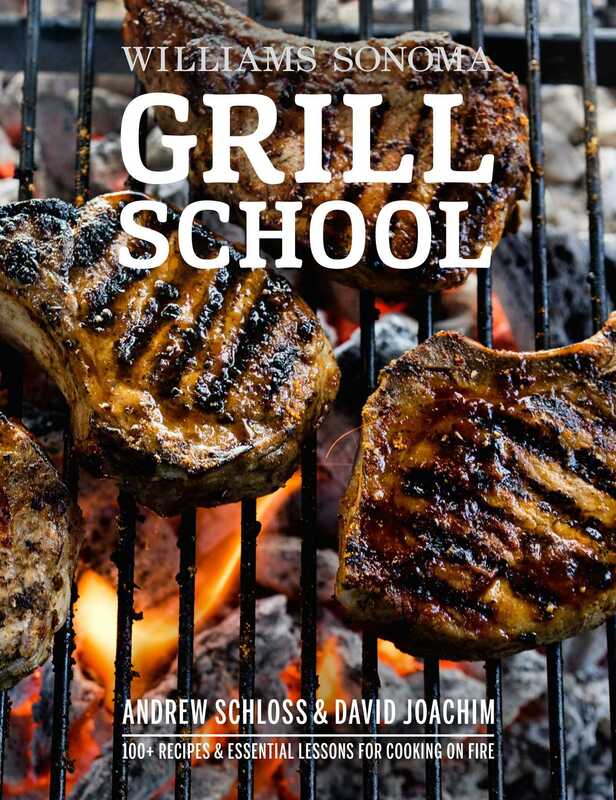 From New York Times bestselling authors and grill experts David Joachim and Andrew Schloss, comes Williams-Sonoma Grill School, the all-inclusive guide to grilling. With 30 easy-to-master lessons, failproof techniques, and over 100 mouthwatering recipes, you'll be well on your way to becoming a grill master. Whatever you grill, you can always make it better. Grill School teaches you how. 1. Heat the grill for medium-high direct heat (400°-450° F/200°-230°C). 2. In a food processor. combine the tahini, water, garlic, lemon juice, 1 tablespoon of the oil, 1'2 teaspoon of the salt, and the cumin and process until a very smooth puree forms, 1-2 minutes, stopping to scrape down the sides of the bowl as needed. Add more water and/or lemon juice 1 tablespoon at a time if needed to make a thick, yet pourable sauce. 3. Starting at the blossom end, cut each eggplant lengthwise into slices 1/4-1/2 inch (6-12 mm) thick, cutting all the way down into the stem end but not through it, so the slices can be fanned out from the stem. Place the eggplants on a rimmed baking sheet. Brush all of the cut sides and the outsides with the remaining 1 tablespoon oil and then sprinkle all of the cut sides and the outsides with the remaining 1'2 teaspoon salt. 4. Brush the grill grate and coat with oil. Using tongs, fan out the eggplants on the grate and cook, turning once. until tender and grill marked. 3-4 minutes per side (see Extra Credit). The eggplants will fan out more easily as they cook and soften. Remove the eggplants from the grill. 5 Spread a generous amount of the tahini sauce on the bottom of a platter. Arrange the fanned eggplants over the sauce and drizzle with a little more sauce. Garnish with the pomegranate seeds and serve with the remaining sauce. they cook. If you like it spicy, dust the grilled eggplant with ground Aleppo pepper or cayenne pepper. For even more flavor, sprinkle the grilled eggplants with za'atar. Za'atar: Mix together 2 tablespoons toasted sesame seeds, 1 teaspoon ground sumac, ¾ teaspoon dried lemon peel, ¾ teaspoon dried thyme, ½ teaspoon dried oregano, ½ teaspoon dried savory, ½ teaspoon dried marjoram, and ½ teaspoon coarse sea salt. The tahini sauce can be made ahead and refrigerated in an airtight container for up to 1 week. Drizzle any extra sauce on grilled fish, lamb, or vegetables. "The new Williams-Sonoma Grill School book is bursting with tasty inspiration, from burgers to tacos to grilled fruit— with the volume turned way up!"